The heat and humidity of a long New Orleans summer can be oppressive. Taking a cool dip in a swimming pool is one of the best ways to temporarily escape the heat. While many people would love the convenience of a pool in their backyard, it can be harder to tell if the installation and maintenance costs are worth it. The answer can vary from person to person. When you are looking for a contractor to install your pool, do your homework. Robert Namer, manager of Blue Haven Swimming Pools, says everyone should check out their prospective pool installation company with the Better Business Bureau (bbb.org) and the Louisiana Secretary of State’s website (sos.la.gov). Namer said customers should find out the strength of the concrete that will be used. He said it needs a minimum of 4,000 PSI for compressive strength. If it’s lower than 4,000 PSI, the concrete will crack. One issue that may be unique to New Orleans residents is what you might find when you start digging for your pool. In 2011, The Times-Picayune published an article about 15 coffins that were found when a man started to dig for a pool on his French Quarter property. The story also noted that many New Orleans neighborhoods and properties, including the Mercedes-Benz Superdome, are on the sites of former cemeteries. 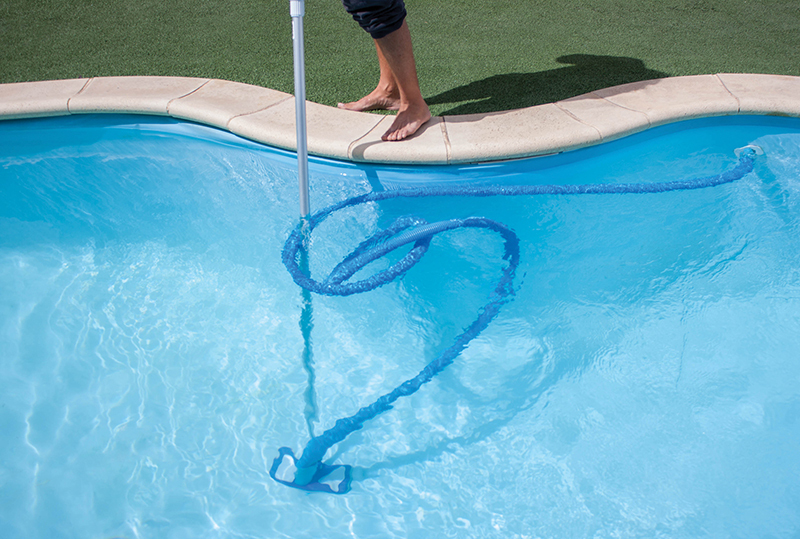 If you have a chlorine pool, you need to be willing to perform the tedious tasks of pool maintenance. Make sure the water is balanced, meaning, it has the right pH, alkalinity and calcium hardness levels. According to Lowes.com, this prevents eye and skin irritation as well as damage to pool equipment and surfaces. The pool needs to be chlorinated to prevent bacteria and algae. Shock the pool weekly to reduce contaminants and break down cosmetics, sunscreen and other wastes that can’t be filtered out of the water. Also, add algaecide and skim floating debris out of the pool. All of the above may sound like a bit of a headache to do on a regular basis. This is why many pool owners are switching from traditional chlorine pools to saltwater pools. Another reason is, chlorine irritates eyes and skin more, as well as having an off-putting chemical odor. New Orleans resident Mary Blue had a saltwater pool installed at her home and she’s happy with the results. “Saltwater is a little more expensive to install, but cheaper to operate over the long haul,” Namer said. The website Fixr.com estimates the yearly cost of maintaining saltwater pools as $70 to $100. For chlorine pools, it ranges from $300 to $800. The website HomeAdvisor.com studied costs of installing pools across the United States. The national average in 2018 for installing an in-ground pool was $48,871. The typical range was $35,674 to $63,567. But these are loose estimates. The prices can vary for many reasons, from the location of the house, to the shape of the backyard, to the type of plaster used and other equipment needs. Before moving forward on your pool installation project, Namer said it is also important to get a guaranteed completion date from the installer and to get detailed information about the installer’s warranty program. “Everything should be spelled out,” Namer said.